Here it comes, the big match. The one i was training for so long, AJKF welter weight title. Starting my professional kickboxing career 2 years ago i was in the same time happy to get this opportunity and lil bit stressed too. My opposent Yuya Yamamoto looks quite confident from the beginning. to be honnest i have a big respect for him, i remember when i arrived in japan i saw his fight in K1max japan. I was impressed how a so young guy is doing so well. The match start straight without observations. 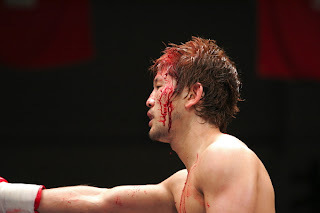 In the fourth round i could get him with an elbow, resulting a cut nasty enought to the medical staff to stop the fight. For the first time in history, a foreigner became champion of japanese kickboxing.